Chronic renal failure (CRF) or chronic kidney disease (CKD) is the end result of a gradual, progressive loss of kidney function. The loss of function may be so slow that you do not have symptoms until your kidneys have almost stopped working. The final stage of chronic kidney disease is called end-stage renal disease (ESRD). At this stage, the kidneys are no longer able to remove enough wastes and excess fluids from the body. At this point, you would need dialysis or a kidney transplant. 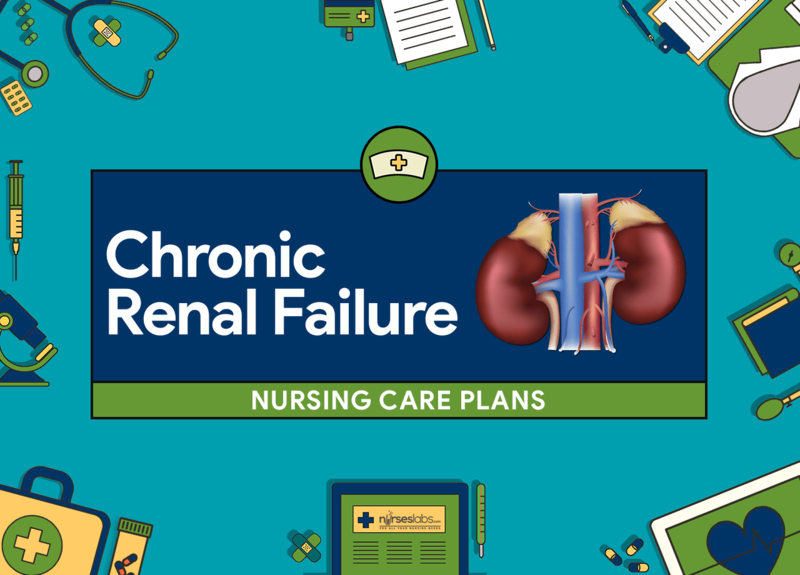 The nursing care planning goal for with chronic renal failure is to prevent further complications and supportive care. Client education is also critical as this is a chronic disease and thus requires long-term treatment. Risk for Decreased Cardiac Output: At risk for inadequate blood pumped by the heart to meet metabolic demands of the body. Maintain cardiac output as evidenced by BP and heart rate within patient’s normal range; peripheral pulses strong and equal with prompt capillary refill time. Auscultate heart and lung sounds. Evaluate presence of peripheral edema, vascular congestion and reports of dyspnea. S3 and S4 heart sounds with muffled tones, tachycardia, irregular heart rate, tachypnea, dyspnea, crackles, wheezes,edema and jugular distension suggest HF. Assess presence and degree of hypertension: monitor BP; note postural changes (sitting, lying, standing). Significant hypertension can occur because of disturbances in the renin-angiotensin-aldosterone system (caused by renal dysfunction). Although hypertension is common, orthostatic hypotension may occur because of intravascular fluid deficit, response to effects of antihypertensive medications, or uremic pericardial tamponade. Investigate reports of chest pain, noting location, radiation, severity (0–10 scale), and whether or not it is intensified by deep inspiration and supine position. Although hypertension and chronic HF may cause MI, approximately half of CRF patients on dialysis develop pericarditis, potentiating risk of pericardial effusion or tamponade. Evaluate heart sounds (note friction rub), BP, peripheral pulses, capillary refill, vascular congestion, temperature, and sensorium or mentation. Presence of sudden hypotension, paradoxic pulse, narrow pulse pressure, diminished or absent peripheral pulses, marked jugular distension, pallor, and a rapid mental deterioration indicate tamponade, which is a medical emergency. Assess activity level, response to activity. Weakness can be attributed to HF and anemia. Imbalances can alter electrical conduction and cardiac function. Useful in identifying developing cardiac failure or soft-tissue calcification. Administer antihypertensive drugs such as prazosin (Minipress), captopril (Capoten), clonidine (Catapres), hydralazine (Apresoline). Reduces systemic vascular resistance and renin release to decrease myocardial workload and aid in prevention of HF and MI. Prepare for dialysis. Reduction of uremic toxins and correction of electrolyte imbalances and fluid overload may limit and prevent cardiac manifestations, including hypertension and pericardial effusion. Assist with pericardiocentesis as indicated. Accumulation of fluid within pericardial sac can compromise cardiac filling and myocardial contractility, impairing cardiac output and potentiating risk of cardiac arrest.